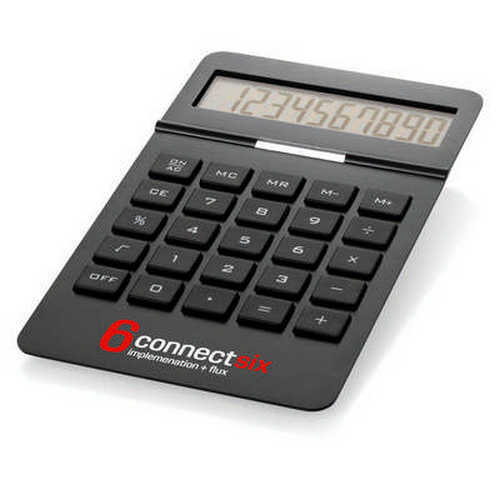 Sturdy desktop calculator. Large 10 digit display. Aluminium face. Solar or battery powered. Large keypad for easy use. Large branding area. Product Size: 180 x 10 x 110mm. Product Packing: Boxed. Decoration Size: 70 x 23mm. Decoration Position: Front. Decoration Method: Pad Print | Laser Printing. Carton Quantities: 40. Carton Size: 43.5 x 34.8 x 29. Carton Weight: 10. Colour: Black | Silver. Price includes : Pad Print 1 Colour / 1 Position. Setup is included.